Reminder – There is less than 48 hours left to get your nominations in for our first Readers’ Choice Awards – don’t be shy or assume that someone else has nominated your title, character or studio – send in your own nomination, whether you’re a developer, PR specialist or gamer. All Canadian titles, components, studios and publishers are eligible. Calling All Canadian Game Dev Types – Autodesk has issued a call for submissions for its 2010 Games Reel. Providing the perfect avenue to flaunt your work, the reel will be showcased at GDC from March 11-13, in San Francisco, Calif. Additionally, it will be streamed live on the AREA and featured on Autodesk’s Web site. If you’ve worked on any recent video game cinematics, trailers, in-game sequences and/or animations created with 3ds Max, HumanIK, Kynapse, Maya, MotionBuilder, Mudbox and/or Softimage, submit your work today. The deadline for imagery submissions is January 15, 2010 and for video submissions, January 29, 2010. Campbell River – Independent musicians trying to find out how to sell music online can now use Website Music Player’s easy-to-install MP3 widget app that lets music artists take control of their income. Instead of handing over percentages to corporate media companies, musicians are able to set up a playlist of their own downloadable songs, and market them on social networking sites that already attract millions of visitors. WebsiteMusicPlayer.com users can load their catalogue of songs into a flash MP3 player widget, choose a skin that color-coordinates with their website, and collect direct PayPal payments from the buyers who purchase their music tracks. Music sellers set their own prices and can track their sales info to help with future marketing plans. Sellers have complete control over the entire process. They can create preview clips that allow buyer to hear enough to decide to purchase, yet don’t give away the entire song. The download process is protected and automated to allow hands-free delivery to the buyer, yet still protects the seller from having their download links illegally spread all over the web. Sellers can capture buyers’ emails to create a list of fans to notify when new songs are released. With the upgraded Platinum service, sellers can have their fans and associates sign up as their affiliates and sell music from their own website sites to increase sales and exposure. 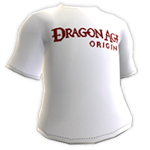 Edmonton – BioWare™ has announced that the Return to Ostagar downloadable content (DLC) for Dragon Age™: Origins will be released on January 5 in North America and Europe for the Xbox 360® videogame and entertainment system and PC versions of the game at a cost of 400 BioWare Points or Microsoft Points. The DLC will be available for the PlayStation®3 computer entertainment system later in January. Return to Ostagar allows players to exact their revenge and embark on a quest for the mighty arms and armor of the once great King Cailan when they revisit Ostagar, the site of the Grey Wardens’ darkest hour, to reclaim the honor and learn the secrets of Ferelden’s fallen king. Return to Ostagar summons players to a new quest in which they will return to the fateful battleground in Ostagar where the Grey Wardens were nearly wiped out. Players will discover King Cailan’s top-secret political agenda and go behind enemy lines to revisit a place that many feared had been lost to history. Return to Ostagar will be available for 400 BioWare Points on the PC and 400 Microsoft Points on the Xbox 360 on January 5. It will be available for $4.99 on the PlayStation® Store later in the month. Dragon Age: Origins is rated M by the ESRB. Surrey – KrabbitSoft released has released KWO_AD, an advanced new demo for KrabbitWorld Origins. As an apology to web response to the current beginner focused demo, gamers will be immersed in true excitement of the game, experiencing the depth of game play and full game mechanics. Viewers will be entranced as the camera takes control playing out dramatic events heralding each interactive segment. 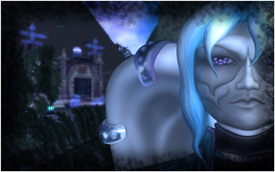 Witness Teella’s dramatic transformation from the lovely high priestess to the ghastly eyeless fallen. Acquire the advantage in the heat of battle with newly learned combo tactics. Play each of six level 92 Krabbits adorned in flaming, poison or ice bracers as you defeat the evil arch nemesis throughout numerous scenes. In the final epic battle defeat all characters you played. Q1 2010 Features to look forward to include story driven cut scenes which will be integrated throughout the game, leading the player’s adventures. KWO Advanced Demo will be integrated as an advanced tutorial for the seasoned gamer, and quick keys tips screens will become accessible in game. Krabbitsoft has also announced that Party Play is also coming to Krabbit World Origins. 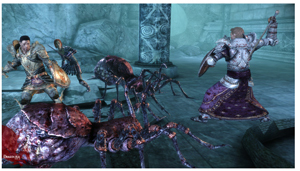 Gather up to four party members consisting of both main and henchie Krabbits as you play through the quest stream. Experience your choice of six classes first hand, each with their unique powers and symbiotic weapon. Take control of individual party members at your discretion leaving the others to fight at your side or from a distance. OTTAWA – NAV Canada reports that a flight plan for an aircraft departing the North Pole on December 24, 2009 has been filed with millions of destinations in Canada and around the world. NAV Canada says it has not handled a flight plan of this size for about a year noting that this breaks the record that was set on December 24-25 2008 by a Mr. K Kringle. NAV Canada does not reveal the identity of pilots filing flight plans but an unnamed source confirmed that it is Mr. Kringle. 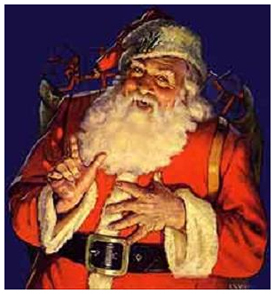 “The paperwork says Kris Kringle, but everyone knows him as Santa Claus,” said the NAV Canada source speaking on the condition of anonymity. The details are confidential, but NAV Canada has confirmed that aircraft will carry a huge cargo of brightly coloured packages and will fly at a tremendous speed guided by a flashing red light at the nose of the craft. “That red light makes the aircraft’s nose so bright. It worked especially well on one foggy Christmas Eve several years back,” recalled one air traffic controller. A new feature of this year’s special flight will be high-tech equipment on board the sleigh that will allow NAV Canada to pick up the flight as it flies over Hudson Bay on the Company’s new Automatic Dependent Surveillance – Broadcast (ADS-B) System. In the past, when it flew over the 850,000 square kilometres of Hudson Bay the sleigh would disappear from the radar screens because of the lack of surveillance coverage. “That was always a concern, but the situation has now been resolved with our new ADS-B system around the Bay and the North Pole’s decision to invest in the on-board equipment,” says a NAV Canada spokesperson. NAV Canada will be hard at work on Christmas ensuring that the normal air traffic control, flight information and advisory services, are provided for this special flight and all other aircraft – with technical operations and engineering support – as we do 365 days a year. NAVCanada, the country’s civil air navigation services provider, is a private sector, non-share capital corporation financed through publicly-traded debt. With operations coast to coast, NAV Canada provides air traffic control, flight information, weather briefings, aeronautical information services, airport advisory services and electronic aids to navigation. Interested parties can track the progress of this very special flight on NORAD’s site, watching Mr. Kringle’s progress as he journeys along his filed flight plan. In the meantime, visit the North Pole to watch as the whole town prepares for this monumental flight. Vancouver – The 2nd Annual Global Game Jam takes place this coming January 29-31 2010 and Vancouver is one of the 100 locations for the jam being held simultaneously in multiple countries around the world. Global Game Jam is an IGDA initiative. In a Game Jam, artists, programmers, students and designers come together to make video games. Each participant works in a small team on a complete game project over the course of a limited time period, usually over a weekend. Mentors support the game-teams by providing guidance and feedback to facilitate teams’ success. With such a small time frame, the games tend to be innovative and experimental. I attended as an observer last year, and I saw lots of fantastic ideas, creativity and innovations happening. If you have the chance, I highly recommend taking part in this event. Register now to be a Participant or Mentor at this fun and educational event! The Global Game Jam will start at 5:00 PM Friday, January 29, 2010 through 5:00 PM Sunday, January 31, 2010 (all times local). Today’s Super Special: Madballs in Babo Invasion by PlayBrains is currently available for 50% off on Steam. Grab this fast-paced action game for your PC from Steam (sale price $4.99 USD) or for your Xbox 360 from XBL MarketPlace for 800 MS Points and play as your XBLA Avatar as you campaign across distant worlds either solo or with four-player online co-op, taking no prisoners in your wake. Challenge your friends (and your enemies) to see who’s the baddest ball on the planet in no-holds-barred 16-player multiplayer arenas with freaky characters or with your 360 Avatar. Try out the Invasion Mode where combatants create the very worlds where they wage war. Dozens of unique character classes, weapons, special abilities, worlds, unlocks, secrets, maps, and game modes give you limitless gameplay. Madballs in Babo Invasion has been nominated in several categories for our 2009 Readers’ Choice Awards. Vancouver – In the face of increased number of independent productions, increased production costs, diminished funding sources and limited funds available, forward-thinking members of the industry have been casting about for creative ways to fund films. An innately expensive undertaking, the making of a film is often decided by the deep pockets of the companies and individuals funding the project. These decisions can heavily influence the final product with ultimatums about creativity, casting, product placement, etc. Further, financial pressures are constraining the industry as piracy cuts into independent film revenues. The Biracy Project™ is a social experiment in crowd-funded filmmaking which will build the audience in advance and give the audience the power to make decisions on how the film will be made. Geertz has a solid history in the film industry ranging from production to media distribution. His frustration with the constraints placed on filmmakers by the financing bodies has led him and a solid team of experienced professionals to develop the Biracy Project™ concept. The Biracy crowd-funding model starts with people choosing their membership level (minimum level is a $25 annual commitment). In exchange, members have access to regular updates via video and blog entries, they get to vote or provide other input on decisions that pertain to the development and production of the movie and they receive a copy of the completed film, To compensate members for their participation, the Biracy Project™ includes a members’ only game, the “Producer Challenge”. Game points are awarded for tasks completed by participating members. In addition to determining the winner of the Producer Challenge, game points will be used to allocate 75% of the movie proceeds among the membership. The winner of the Producer Challenge will receive the Grand Prize of an Associate Producer credit on the film together with appropriate financial compensation. Montreal – Psychoz Interactive is proud to announce its first iPhone/iPod touch title, Dead Strike is now available for purchase on the App Store. Fight your way through a sprawling 3D, zombie-infested city as four survivors attempt to stop an outbreak of the living dead. The creation of an antidote depends on the group delivering a sample of the deadly virus to a hospital on the other side of the city. But as the foursome’s grim fight for survival continues, it becomes apparent that there’s more to the virus than anyone thought possible. As the group are systematically hunted by these abominations of nature, they soon discover that these cannibalistic monsters aren’t as mindless as they look. 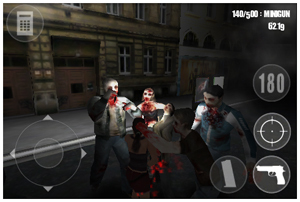 Dead Strike is the action-packed horror survival game the iPhone has been waiting for, with a powerful, twisted storyline, a brutal arsenal of weaponry, stunning graphics and more zombies than a BBQ at George Romero’s house. With a four player co-operative multiplayer mode coming soon in a free update, fans of Left 4 Dead, Killing Floor, Resident Evil and Silent Hill will devour Dead Strike, brains first! * 46 levels, packed to bursting with legions of the undead. * Unique abilities for each of the four characters. * Nine different weapons including flamethrower, mini-gun and chainsaw. * Dynamic lighting, lens flare, mist and dust effects on all iPhone and iPod touch devices. * Day and night battles. * Choose a guns blazing action-packed approach or stealth tactics. * Incredible AI where the undead react to sounds and action and can communicate with each other in real time. * Expansive and detailed 3D world to explore. * Rich gripping storyline, edited and co-written by Pure Square Go. * Buckets of blood splattering effects with sprays and splashes for full-on horror effect. Yarmouth County – Xona Games has released a new trailer for their in-development title Duality ZF featuring some amazing game-play. In this video you will see the Boss Rush, which will unlocks once you beat the game; multi-directional controls, which unlock when beat all game modes with Dual Play control, and Dual Play control which will unlock once you beat all game modes in Solo Play. Duality ZF looks like one big, mad challenge waiting to happen – and has an awesome soundtrack from Imphenzia. Ontario – Howling Moon Games has released their newest iphone title Solar Advance in the iTunes App Store for 99 cents usd. As the player, you are the intelligence controlling an advance technology that can store the suns energy for use back on a distant planet. As the intelligence you will need to motion special matter that absorbs certain forms of energy. The energy that needs to be caught bursts from suns. Along its path it changes shape and colors. The color of the flare needs to be met by the same color matter for it to be harnessed. * Each new level leaves the player with more matter to control, more color differences from the solar flares. * A timer calculates your overall game score, preventing your MAT’s from being destroyed decreases your overall time. * Each sun has a different gravitational pull. Yarmouth County – Xona Games has announced that their newest game, Decimation X is coming to Xbox LIVE Indie Games (XBLIG) in January 2010 for 80 Microsoft Points. Xona Games has not yet released a lot of promo material for the game, but according to the Decimation X web site, game play will revolve around intense retro-styled shoot ’em action for 1 – 4 players and feature music from Imphenzia. Gormley – Digital Leisure’s Dragon’s Lair is now available for download via Nintendo’s DSiWare store. Rated by the ESRB as E10, Dragon’s Lair is available for 800 DSi Points. Title Details: You play the heroic Dirk the Daring, a valiant knight on a quest to rescue the fair princess from the clutches of an evil dragon. Control the actions of the daring adventurer and find your way through the castle of a dark wizard who has enchanted it with treacherous monsters and obstacles. In the mysterious caverns below the castle, your odyssey continues against the awesome forces that oppose your journey to the dragon’s lair. 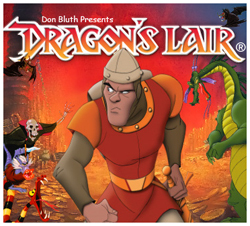 Dragon’s Lair is a fully animated classic arcade game from legendary animator Don Bluth. Game Developer Research is pleased to announce the debut of its sixteenth report, the ‘Game Developer Census 2009‘. The in-depth 248-page report aims to create an accurate list of each significant developer and publisher within the video game industry in the United States and Canada, as well as an accurate list of staff averages for each company. The Census report lists more than 700 companies alphabetically by U.S. state and Canadian province, along with general contact addresses, website information, estimates of employee numbers and details on their market specialties (from casual gaming, online gaming, mobile gaming and serious gaming to PC, handheld or console gaming). Not included in the Game Developer Industry Census estimates are game tools company, game contracting/services company, PR, marketing, and external business service, or game distribution and retail professionals. The report is intended to be a valuable tool for game industry trendwatchers, contractors, service companies, and other entities wanting to acquire accurate information to reach out to the North American game market as a whole. According to Techvibes, “The report reveals that the United States videogame industry employee count is essentially flat year-over-year, rising slightly from 44,400 to 44,806. The small rise in North American game industry employment was marked by an unusually high number of new studios – particularly in social and online gaming – springing up to counterbalance the many closures that occurred throughout the rest of the industry. Canadian companies, however, saw growth that can almost be called explosive. The continued establishment of new studios and expansion of existing large studios led Canada’s the employee count in the Census to rise 30% year-over-year. The totals rose from 9,500 Canadian video game employees in 2008 to 12,480 in 2009. Toronto – Interactive Ontario today announced that registration is now open for INplay 2010. This two-day conference, taking place at the Liberty Grand in Toronto, is designed to bring creators of kids interactive properties and developers together to explore inspiring ideas for the future. “With all the changes happening in content creation and delivery, INplay is a huge opportunity for inspiration, to hear some of the latest research, and connect with potential partners in the kids interactive market,” said Ted Brunt, VP Interactive Production, marblemedia. Early bird pricing ends February 25, 2010. Members of Interactive Ontario receive a further discounts on tickets. For registration, press accreditation and to sign up for the INplay newsletter, visit their website. INplay is for game developers/publishers, broadcasters, content producers/distributors, interactive/mobile/social media developers, toy/game manufacturers, book/magazine/comic publishers, marketers, researchers/child psychologists and all businesses with interest in the kids’ interactive media. This project is spearheaded by IO in partnership with industry leaders including: Astral Media Inc, Bitcasters, Blue Print Entertainment, Breakthrough New Media, Capybara Games, CBC, Corus Entertainment, Decode Entertainment, Earth Rangers, Kids Can Press, marblemedia, Meridian Artists, Portfolio Entertainment, Spin Master Ltd., and zinc Roe Inc.
Ottawa – Fuel Industries has had a very busy year, it seems – in a summary of 2009 projects, Fuel released information about their work with EA, Intel & Dell, Microsoft, Toyota, MTV and Screenlife. For the record, I want that screen used in the Intel 360 “Future of the Data Centre” project. 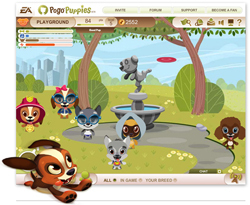 Some of Fuel Industries’ work can be found on Facebook in the way of EA Pogo Puppies, an interactive application that allows Facebook users to adopt and care for cute little puppies. The studio also created the SceneIt! Online Facebook App, bringing Screenlife’s interactive trivia games to the masses. Meanwhile, Twitter users were invited to learn, compete and create haiku pieces extolling the virtues of Microsoft’s Windows Server 2008 R2. Fuel also worked with MTV, Verizon and Electric Farm Entertainment to create a growing online, interactive property for Valemont University through the use of blogs, websites, alternate reality and social media. Toyota and Fuel worked together to build excitement and adventure for Facebook users with their Adventure Finder App. This App, built to promote the new Toyota 4Runner, uses interactive quizzes to generate possible off-road adventures. Gormley – Digital Leisure has released a new trailer for the DSiWare version of Dragon’s Lair, which will be available from the Nintendo DSiWare download zone this coming Monday (December 21st). Ottawa – Fuel Industries has produced a very nice way to say Merry Christmas to all of their friends, and they’ve done such a great job I wanted to share their efforts with all of our readers. Designer Alyssa Munaretto, Producer Braden Brailey, Rob Plowman (Director, Fuel Sounds) and Nick Ianniti (Director of Communications) got together and recorded three Christmas songs for our listening pleasure. The tracks are downloadable, so you can add them to your Christmas playlist. Thank you and Happy Holidays to everyone over at Fuel! Participants will spend their Camp time practicing techniques to generate new ideas and expanding upon those ideas in order to accomplish a shared goal such as creating a product or completing a project/challenge. There are no lectures, just engaging activities that facilitate learning, interaction and growth. Registration is now open, and at only $150.00 (including sandwiches, fruit and tea, coffee & juice), Innovation Camp offers great value to its participants. I’ve heard plenty of good things about the Camp, so if you have the opportunity to participate, I’d say give yourself a great Christmas present by registering today. Vancouver – IUGO Mobile Entertainment has put many of their great titles on sale – visit the iTunes App Store and pick up a few – or all – of them and get many hours of fun and challenge for very little money. Sounds like a good return on investment to me!